We know what you’re thinking. What is it with the Scots need to deep fry anything that will stay still long enough to be dunked in batter? But this contemporary twist on haggis is great as a starter or a mid-week snack, and can be easily prepared at home. 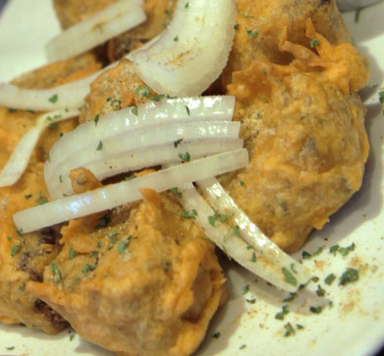 Haggis pakora combines traditional Scottish haggis ingredients with the spices, batter and preparation method of Indian pakoras. Haggis, we’d recommend Macsween Haggis (454g). Mix the dry ingredients for the batter and then create a smooth paste by adding water while stirring with a spoon. Leave for around 10 minutes. Drain on kitchen paper and serve on a bed of crisp lettuce with chutney or a haggis condiment on your choosing. Looking for a vegetarian option? Try using Macsween vegetarian haggis. The added pulses in vegetarian haggis give the dish added crunch.